Posted in: Art, Music, Photography. Tagged: cancer, Chris Botti, Emmanuel, Femme assise sur fond noir, Henry Matisse, Lucia Micarelli, Nelson-Atkins Museum of Art, Oil on canvas, Woman Seated before a Black Background, World War II. Henri Matisse’s painting is alive with brilliant color and rhythmic line. By placing the chair off-center and shifting the woman’s pose further to the right, he establishes a lively informality. The woman’s tilted head, smile, kind eyes, and relaxed arms enhance the sense of ease. The visual weight of the black background is lightened by the lively pattern of arabesques scratched into the wet paint with the pointed tip of the artist’s brush handle. 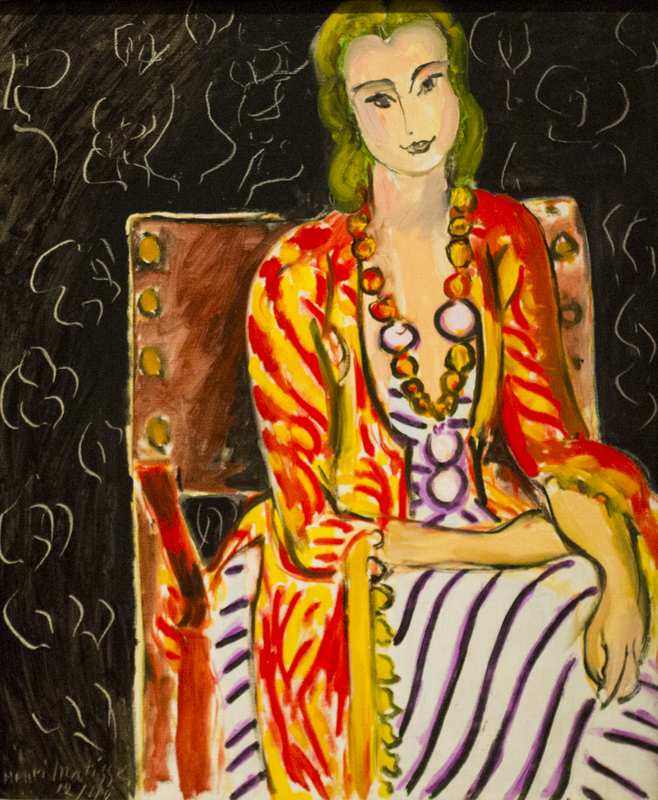 Matisse painted this affirmation of life amid the tumult of World War II (1939–1945) and during his recuperation from surgery for stomach cancer.